Reference number for this case: 18-oct-54-Uzel. Thank you for including this reference number in any correspondence with me regarding this case. Mr. and Mrs. Perrichon had said that they saw an orange flying saucer in the evening, the same thing having been observed in several neighboring communes. Rome, Oct. 19. -- The flying discs continue their dance in the sky of the peninsula and in Capri, one of these mysterious machines landed on the terrace of writer Curzio Malaparte's villa. Mr. Castello who initially thought it was a helicopter approached the summer residence of Curzio Malaparte and was very suprised to see four men of small size going down from the disc. The passengers of the machine, who were clad in an outfit, remained around the disc approximately half an hour. The author indicates that on October 18, 1954, in Uzel in the Côtes-du-Nord, "one does not know what they saw." 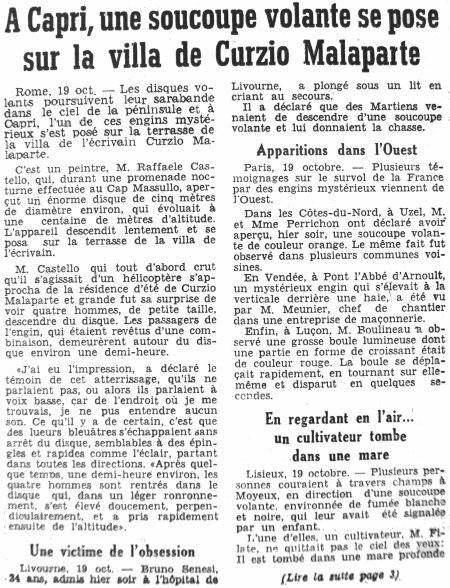 He indicates that only Paris-Presse for October 20 mentions this case without giving even one detail, that it is impossible to go up to the source and not even possible to check the date. Totally insufficient information, probably the 08:45 p.m. meteor. 1.2 Patrick Gross March 3, 2017 Addition [ub1]. 1.3 Patrick Gross January 20, 2019 Addition of the Summary. Explanations changed, were "Not looked for yet."